The all-new Volvo XC40 is launching in India today and marks the Swedish car maker's entry into what is the volumes end of the luxury car space in India currently, the compact luxury SUV segment. For now, the XC40 is being launched only in the fully-loaded R-Design trim which comes loaded with features and boasts serious equipment levels, including segment firsts like radar-based driving assistance and safety systems. Volvo is targeting millennials with the XC40 and that's something that reflects in the exterior and interior design of the SUV. You can follow our updates from the launch event happening in New Delhi here itself. And while we bring you all the details from the event, you can also read our first drive review of the Volvo XC40 right here. Here’s a quick snapshot of the radar-based features in the @VolvoAutoIndia #XC40. The SUV also gets 7 airbags as standard. Another convenience feature in the @VolvoAutoIndia #XC40 is the hands free opening for the boot, as standard. 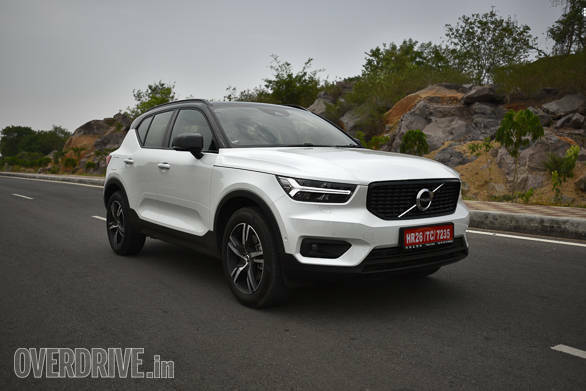 As far as exterior dimensions are concerned, the @VolvoAutoIndia #XC40 is larger than its German rivals, the Audi #Q3, BMW #X1 and Mercedes-Benz #GLA. The interiors of the @VolvoAutoIndia #XC40 are finished in ‘lava’ orange which is actually faux wool, made from recycled materials. The @VolvoAutoIndia #XC40 features a 9-inch touchscreen for the infotainment system that is dubbed the Sensus, and integrates Apple CarPlay and Android Auto connectivity as standard. The @VolvoAutoIndia #XC40 has won the European car of the year already, and the brand hopes the SUV will do really well in India too. Charles Frump, MD, @VolvoAutoIndia on stage now, talking to us about the strides the brand is making in India. Volvo saw a 28 percent growth in India last year and is hoping the #XC40 will give its growth a further boost. For now, @VolvoAutoIndia is only launching the diesel engined version of the #XC40, powered by its 4-cyl, D4 Diesel engine that offers 190PS and 400Nm in this guise. A petrol option will be considered later.